For adults age 50 and over, making healthy food choices and staying active are crucial lifestyle habits. Recent studies show that a good diet can not only help you resist illness and prevent certain diseases, but also defy or delay some of the common effects of aging. “We need fewer daily calories as we age because our metabolism naturally begins to slow,” says MPCP Arnold physician, Amanda Malone, M.D. “Since you don’t need as many calories, those calories you do consume become very important. Your diet after age 50 should include a variety of healthy, nutrient-dense foods. Add in daily exercise and you’re on the path to a higher quality of life and enhanced independence as you age,” she adds. As we all know, our body changes with age. There is a reduction in muscle, an increase in body fat, and your total body water decreases by up to 20 percent. You need fewer calories than you did at a younger age since your basal metabolic rate decreases as muscle mass declines. Another effect of aging is that the body becomes less efficient at absorbing vital nutrients and minerals from our diet– including calcium, vitamin B and folate. Certain medications can also affect appetite, or block absorption of some vitamins and nutrients. So, what should we “over 50s” do? These calories should come from a variety of fresh fruits and vegetables (5 a day when possible), unprocessed grains, and good sources of protein. To include more high quality protein in your diet, try replacing red meat and processed meat with fish, skinless chicken and turkey, low-fat dairy, and plant-based protein like beans, nuts and seeds. “A variety of foods is best because you’ll have several sources of required vitamins and you won’t get bored by the same foods. Also, the more ‘whole’ unprocessed foods you can eat, the better. Go for the whole fruit, not fruit juices. Go for fresh, grilled or baked chicken, not processed lunch meat,” says Nurse Practitioner, Rachel Sweeney, of MPCP Arnold. Also, if you are trying to maintain- or lose weight- keep track of daily calories with a food diary or a free app, such as myfitnesspal.com. 2. Drink water & eat more natural fiber. As we age, we can become more prone to dehydration. Post a note in your kitchen reminding you to sip water throughout the day and to drink water with meals. Nutritionists say in general that 3-5 large glasses of water a day is adequate after age 50…you don’t need to go for 8-10 as we often hear. Make drinking more water a daily habit and you will help keep your mind sharp, and body regular. Staying hydrated keeps skin looking younger too! Dietary fiber also helps keep the body and bowels regular, but can do much more, such as lower your risk of heart disease, diabetes, and certain cancers. Women over 50 should aim to eat at least 21 grams of fiber a day, and men over 50 at least 30 grams per day. Good sources of fiber include whole grains, oatmeal, beans, and uncooked fruits and vegetables like carrots, apples and berries. While it’s okay to skip meals occasionally, regularly missing meals or heavily restricting calories is unhealthy. Nutritionists advise those over 50 to eat three meals a day, or to break meals up into 5 smaller meals. Starting the day with a healthy breakfast gets your body going and is a good way to get some fruit, fiber and protein in your diet. Try yogurt topped with bran cereal and berries, or a veggie-packed omlette, peanut butter on whole grain toast or old-fashioned oatmeal with walnuts and fruit. Snacking is okay as well to tide you over and keep your energy up during the day. Choose healthy options like almonds over chips and fruit instead of cookies. Other good snacks are a slice of cheese and whole grain crackers, veggies and hummus, and even a small cup of soup. 4. Read labels, and cut added sugar and sodium. 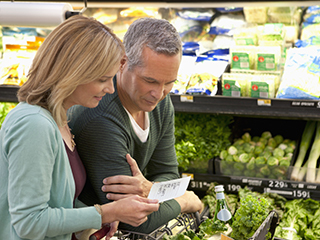 While it takes a bit more work, reading food labels can definitely help you make better food choices. Labels break down how much protein, carbohydrates, fats, sodium, key vitamins and minerals, and calories are in a specific serving. Each label also has an ingredients list, which lists the ingredients from largest amount to smallest. Once you start reading labels you’ll be surprised how many foods list sugar or high fructose corn syrup as the first (largest) ingredient! Sugar is added to many of our foods to enhance the flavor, but many are crediting all the sugar in our diet to the obesity epidemic. Sugar may also cause inflammation in the body, so limiting it is good not only for weight control, but also possible disease prevention. Reducing sodium (salt) will help prevent water retention and high blood pressure. Look for “low-sodium” options when shopping or try to season meals with herbs and spices other than salt. 5. Be cautious about supplements. If you are over 50, some of the key vitamins and minerals you should get enough of are vitamin B12, vitamin D, folate and calcium. It is better to meet your needs through diet, but these are so important that you might want to consider taking supplements. Talk to your doctor about which, if any, supplements you need and don’t overdo it. High doses of certain supplements can be harmful, especially if you are on medications. The benefits of exercise throughout your life can’t be over-stated. But as you age, even moderate exercise has been proven to add years to your life—and to make those years more enjoyable and independent. “Regular exercise slows the effects of aging and many age-related disorders such as diabetes, stroke, cardiovascular disease and osteoporosis,” says Dr. Malone. “But that’s only the tip of the iceberg. We know that exercise reduces the risk and seriousness of falls and fractures, keeps our minds sharp, and encourages social interaction,” she adds. It’s never too late to start exercising either. Start slow– take the stairs instead of the elevator, keep carrying your groceries, and try a new exercise class. As always, talk to your doctor about an exercise plan, and which activities you should consider given your age and current health status. Dr. Malone joined Maryland Primary Care Physicians, LLC in 2006 and is certified by the American Board of Family Medicine. She received her medical degree from Wake Forest University School of Medicine in 2002 and completed her residency program in Family Practice at Stamford Hospital in 2005. Rachel Sweeney, CRNP joined Maryland Primary Care Physicians, LLC in 1999. She received her Bachelor of Science in Nursing degree from Villanova University in 1991 and her Master of Science in Nursing degree from Marymount University in 1997. Ms. Sweeney is board certified by the American Nurses Credentialing Center in Family Practice.